Moeder Genius Pregnancy Formula is a food supplement designed to enhance body milk production for mummies. It doesn’t contain any chemicals. Moeder functions to supply the specific nutrition needs for pregnant women, newly delivered mummies and breastfeeding mummies. Moeder not only enhance body lactation, it also brightens the skin of both mummy and the baby. Consuming Moeder can minimize jaundice to the infant. 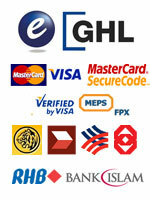 You have save more from buying with us! We absorbed your 6% GST! 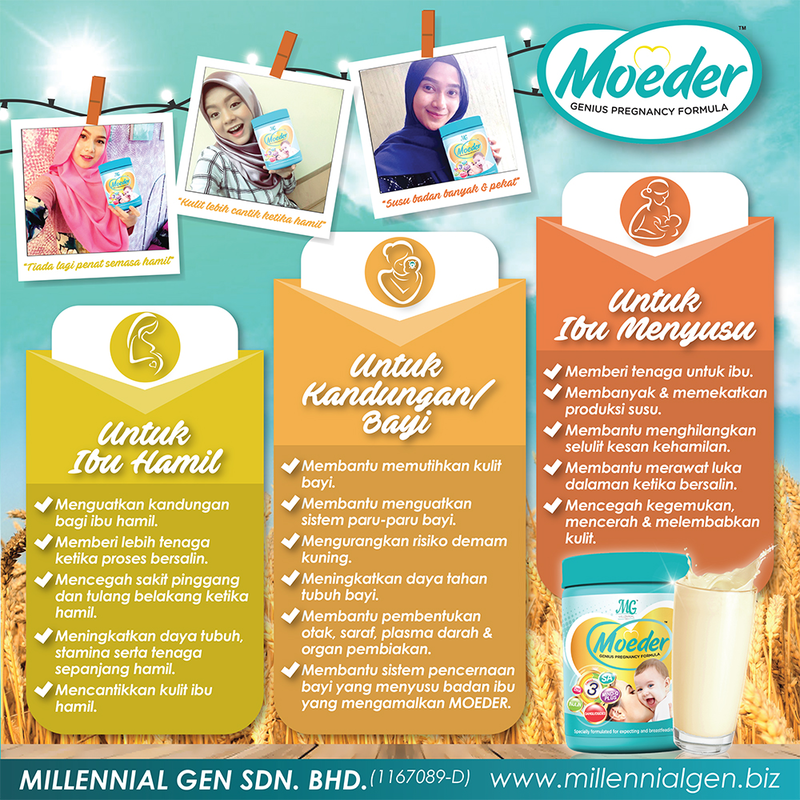 What is Moeder milk booster? Moeder “milk booster” is a food supplement designed to enhance body milk production for mummies. 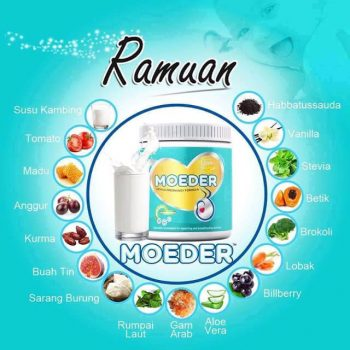 Formulated from Sunnah ingredients (such as goat’s milk, nigella sativa, honey, dates) and natural ingredients (such as bird’s nest, seaweed, betel); Moeder functions to supply the specific nutrition needs for pregnant women, newly delivered mummies and breastfeeding mummies. Consuming Moeder during pregnancy will enhances body immune system, stabilized metabolism, moisturizes skin, reduce depression and stress, reduce high blood pressure and provide sufficient energy needs. Moeder benefits to the infant as well; it enhances body immune system, prevents asthma, and stimulates brain and fetus development. Formulated from various Sunnah ingredients and natural herbal ingredients; it doesn’t contain any chemicals. Moeder is to be consumed by pregnant woman, newly delivered and breastfeeding mummies. Moeder is made in the form of powder which can easily be absorbed by body upon consuming it. Moeder not only enhance body lactation, it also brightens the skin of both mummy and the baby. In addition it will provide the wholesome nutrition for both mummy and the baby. Consuming Moeder can minimize jaundice to the infant. “Honey heals wounds faster than standard dressings (BBC News, 2011)”. “Clinical trials at the Waikato Hospital have shown that even out of the lab, UMF Manuka honey has amazing healing properties (BBC News, 2004)”. “Leaves of the fig tree have shown to have antidiabetic properties that can actually reduce the amount of insulin needed by persons with diabetes who require insulin injections (WHFoods.com)”. “Figs, naturally increases potassium and is therefore encouraged to help lower blood pressure (BBC Goodfood)”.